Diane Samuels is an artist whose work is often experienced as an unfolding: Initially, you see or sense an image but as you approach you are overwhelmed by a profusion of recognizable, detailed elements. In disengaging, you re-assemble the image with a vivid memory of the detail. 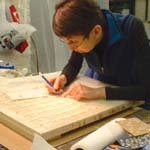 Because the elements–sometimes hundreds of thousands–are typically hand-worked and often individually inscribed with the language of others, the process and the art are also an implicit commentary on the dignity of work, the importance of attention and care, and the relationship of collective knowledge and individual meaning. Samuels has had solo exhibitions at the Carnegie Museum of Art and the Mattress Factory Museum in Pittsburgh; the Leo Baeck Institute and Kim Foster Gallery in New York; the Contemporary Arts Center, Cincinnati, Ohio. Samuels has also shown and worked extensively in Europe, including Germany, France, Poland, Hungary, and Slovakia.